Strip the peel off the grapefruits? Check. Soak in 40% ABV vodka (I used Finlandia) for two weeks? Check. Shake every couple of days? Check. Strain out the grapefruit peel? Check. Add simple syrup to make up a third of the total volume? Check. Leave in the fridge for a week to marry? Big ol’ check. So, three weeks after the start of this groundbreaking project, I humbly present ednbrg’s Finest Grapefrucello! 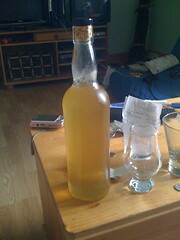 It’s got a lovely translucent golden honey colour to it, with a smooth, syrupy mouthfeel. On the tongue, it’s fairly uncomplicated – it tastes of grapefruit and that’s about it – which is to be expected, I guess. Being a first attempt there are a couple of things I’m unhappy with. For one, there’s a bit of a burn from the alcohol coming through when the liqueur warms up, and the flavour doesn’t seems to finish rather more quickly than I’d anticipated (though that could be a thing that happens with grapefruit?). But, as my maiden voyage into the world of home-made liqueurs and syrups, I’m pretty damn happy with it. Coincidentally, I’m heading into work to do some cocktail training so hopefully I’ll have a couple of recipes to share later on. This entry was posted on	October 1, 2008 at 2:47 pm	and is filed under Projects.